John 5 and his band the Creatures—bassist Ian Ross and drummer Logan Miles Nix—have announced a new full-length studio album, Invasion, for release in 2019. The effort is the follow up to 2018’s concert document, It's Alive! Invasion will be teased on New Year's Day 2019 by way of a music video for the new track "Zoinks!" inspired by Scooby-Doo. Directed by Matt Zane with animation from Disney animator Brett Broggs (Frozen, Wreck-It Ralph), the video will also feature the voice-acting talents of Nikki Sixx, Susan Olsen (Cindy Brady on The Brady Bunch), and Fred Coury. Coury also is credited for scoring the video alongside John 5. The video will be premiered via John 5's YouTube channel. 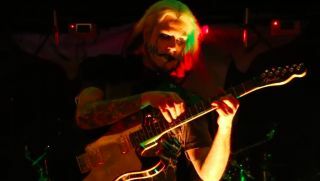 Said John 5: "Get ready for the Invasion tour! I will be playing some songs from my new record, a brand new medley, and much more. I'm really excited to have Jared James Nichols out with us. This tour is something you're not going to want to miss!" Added Jared James Nichols: "As a young budding guitarist, I grew up with a Guitar World cut out picture of John 5 on my bedroom wall. He was always one of my 'guitar heroes.’ He is the total package... insane technique, amazing musicality, with a style and look all of his own. Needless to say, when I got the call for this tour, my jaw dropped. I'm absolutely honored to warm up the stage for him every night across America and Canada. I'm getting my chops ready to tear it up!"